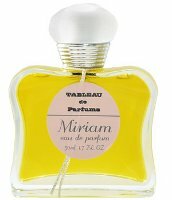 When I first dabbed on Tableau de Parfums Miriam Eau de Parfum, I couldn’t get the thought out of my head that it reminded me of something. Something vintage. What? I smelled my wrist and concentrated. Calm, snuffy aldehydes. Lots of violet. Creamy sandalwood. Then it hit me: Miriam smells an awful lot like Balenciaga Le Dix. Once I wore them side by side, I could see that Miriam and Le Dix differ distinctly. But besides major notes, they share a feeling of gentle femininity that isn’t fashionable these days. Miriam is the first fragrance in Tableau de Parfums, a planned series of fragrances by Andy Tauer of Tauer Perfumes created to accompany film shorts from the Woman’s Picture film series by Brian Pera. During this ten-year project, Andy Tauer and Brian Pera will work together on three films — Miriam, Loretta, and Ingrid — and their accompanying fragrances. Miriam’s notes are bergamot, sweet orange, geranium, violet blossom, rose, jasmine, ylang, violet leaf, lavender, vanilla, orris root, and sandalwood. Miriam does feel old fashioned, and I think it’s because of the violet that dominates Miriam at first. Some reviewers have suggested Miriam’s aldehydes give it its vintage feel, but lots of fragrances these days come fizzed to the gills with them. Estée Lauder White Linen, Natori, and Narciso Rodriguez Essence are just a few. On the other hand, clear, sweet violet is almost Victorian, and it must be a real trick to make a violet-centered fragrance smell comfortable to the average perfume wearer today. Balenciaga Paris succeeds in bringing violet to the 21st century, but it seems to do it by deliberately removing any hint of violet’s face-powder-candy-and-lipstick side. Other violet-infused fragrances, like L’Artisan Parfumeur Verte Violette and Guerlain Les Météorites, don’t even try to fight it. As Miriam ages, it begins to smell more like a floral oriental than the clean, ladylike aldehydic floral of Le Dix. While Le Dix continues to waft violet, ylang ylang, musk, and sandalwood in its natal 1947 language, Miriam warms up and sweetens with vanilla. Lavender keeps the vanilla from turning to cake. I don’t know if Miriam’s warmth modernizes it exactly, but like Christian Dior Dune’s unexpected mix of amber and lavender, to me it does keep it interesting and less predictable. If I had to describe Miriam the perfume as a woman, I’d say she was demure, down to earth, strong, and emotional. Ingrid Bergman comes to mind. While Le Dix spends the morning shopping in the city for doeskin gloves and little hats, Miriam is home in a flower-print dress, writing letters. My guess is not everyone will like Miriam, but the people who do like it will love it. Tableau de Parfums Miriam Eau de Parfum is available at Luckyscent for $160 for 50 ml and $40 for a 7 ml purse spray. The 50 ml bottle comes with a DVD of the Miriam film and a novelette about Miriam Masterson. Hmmmm, you had me right up to “flower-print dress”, but maybe it’s a buy just for the days I’m being a total “domestic poseur”. I’m pretty much a sucker for anything with a vintage vibe and this sounds lovely. Andy Tauer is so talented and Lonestar Memories garners compliments everytime I wear it. Great review as always Angela! I love vintage fragrances, too, but although I appreciate Miriam, it wasn’t a coup de foudre. Lots of people do love it, though. I’ve never smelled Le Dix, but the perfume Miriam reminded of was Guerlain Vega (again, vintage). I’ve only smelled the new (so within the last four or five years, I guess) Vega, and I do love it. I see the resemblance you’re talking about in both fragrance’s warm fullness. I put on some Vega, and I definitely see the resemblance! Besides aldehydes, I wonder if the ylang ylang links them, too. I think you’re right! Vega and Miriam are warm and sentimental. I’ve got a bit of both vintage and rerelease Vega, and I actually prefer the new, but they are both gorgeous. I love Miriam, too. Vega is truly wonderful. I wish it weren’t so danged expensive. If Miriam is anything like Vega, then I definitely have to try it! I love Vega, and although I am normally hesitant to buy anything larger than 50 ml, I have no doubt I will eventually use up my bottle. I am a life-long fan of floral aldehydes, having grown up sniffing my mother’s no 5 and Arpege at every opportunity. I think I actually prefer Vega to no. 5. I love violet scents too. BTW, I got my Vega by using a NM gift card that I got from cashing in some credit card reward points, so it cost me only about $80 out of pocket. Even though I still did, technically, pay full price, as I could have used the gift card for something else, it didn’t feel the same as if I used money from my paycheck. Somehow “free” money isn’t the same as money you have to actually work for. So if you want an expensive bottle, wait until you have some free money (reward points, rebates, birthday/holiday gift money, lottery tickets, etc), and use that. I figure if you use money you didn’t know you had coming to you, it doesn’t count. I’m with you–I prefer Vega to No. 5, too. There’s something warmer, earthier about it, yet it still has the elegance of an old fashioned floral aldehyde. What a great idea about using rewards points! I love Miriam and I’m contemplating a full bottle. I love pretty much everything about it – the old-fashioned opening through to the more modern, Taueresque finish. Is it just going to be the three fragrances in Tableau de Parfums? I guess I had the vague impression that more would be added as the years went on, but I’m not sure. Three was the impression I got from the website–three over ten years. Le Dix is nice, and Vega is truly wonderful, I think. Someday I’ll have a bottle for sure. Miriam is lovely and it reminds me of a number of vintage floral aldehydes. I received a small decant from a friend and after I first spritzed it on, I sat in front of my collection, trying to figure out the closest match. Vintage Revillon Detchema wasn’t too far off. The notes are different, but the effect is very similar. I tend to wear most of these in warmer weather, so I’ll look forward to wearing this in the spring! I wonder how different Miriam is sprayed from dabbed? I dabbed from a sample vial, but I bet sprayed Miriam is really lovely. I really, really want to try this one (maybe I’ll be a winner in the Advent contest!). I love violet, and wore Le Dix for years, although my current violet/rose perfume love is Guerlain’s Attrape Coeur. Thanks for reviewing! Hey, you might really love this one! My favourite part is the luminous vanilla drydown. I feel mixed about the beginning, though, sometimes finding it interesting powdery/musty smell and at other times finding it to have a sweet staleness. I have liked it more and more on subsequent wearings though, and now I will have to go see if I can discern the violet! I was surprised at how prominent the vanilla was once the fragrance settled. I’m not complaining, though! I guess I’ll play the role of the sole detractor — this one actually made me ill. There are a few Tauers that I adore, but this one had something in it that amplifies a commonality among many of his scents, and in turn, may have turned me against the whole line and the four Tauers that I own. Uh oh. I haven’t smelled all of his fragrances, but I love Une Rose Chypree and respect many of the others. Yes, I own URC, CpA, Incense Rose and LADDM (which I really don’t love – impulse purchase). At least CpA doesn’t seem to have whatever it is that I’m not liking in it, nor does Incense Rose. But I’m afraid to try my URC again – I think it does. I need to put some time between us, I think. I hope it all works out in the end. It would be a tragedy not to be able to wear the fragrances after this! This is my favorite of Andy’s by far; I love vintage, so I suppose that shouldn’t have come as any surprise. I have been trying to decide what perfume to wear this evening, and you have just made my mind up for me with your mention of violet. I don’t remember getting any violet at all; I definitely need to re-evaluate this with further sniffage. It reminds me most of the drydown of Nuit de Noel, so I assume I am getting mostly sandalwood from Miriam? I’m glad you love it! Miriam smells really violet-y to me, and although I love the sandalwood I do smell in Miriam, and it’s definitely there for me, I don’t get tons of it, and vanilla even overrides it in the end. I wonder if our samples are different, or maybe our skin is handling Miriam differently? Now I’m longing for some Nuit de Noel. I’m going to go put some on right now. Hi Angela, Nuit de Noel sounds interesting. I like taking tips from you about things you like. i am wearing Eau de Merveilles (not sure of the spelling) that you recommended. It has puzzled me for days because it reminds me of something that I can’t quite place. It might be YSL’s Nu. Or maybe even a whiff of Sung. Have you noticed those connections? The violet does a zoom-by showing for me, and then it’s gone within a few minutes. Miriam spends most of its time in that sandalwood-vanilla drydown, and it’s so pretty, so almost-edible. Overall, though, it has a wistfulness that almost makes me cry, a nostalgia for the days when people you trusted carried you, drowsing, from car to house and tucked you in with kisses. The violet perseveres for a good hour on me! Maybe it’s the violet blossom-violet leaf combo. Today the jasmine feels more prominent than when I worn it before, too. I need to try this one sprayed. What a lovely description of being tucked in! Those where the days. I was lucky enough to win the first day of Andy Tauers advent calendar giveaway and picked Miriam, unsniffed. It was love at first sniff! I can’t get over how “me” it is, and I crave it on days I don’t wear it. I’m already worrying about what I’ll do when the bottle is empty! I love it thru every stage of development, from the opening notes to dry-down. The dry down on me is sweet, warm, creamy but the dry down on fabric is pure sandlewood, HEAVENLY! You’ve pretty much described me to a T, except that I’m not very emotional But I am a down to earth, ladylike, domestic homebody who wears floral-print dresses almost exclusively. How lucky to have a perfume that is so perfect for you–and all by chance! yay, so glad it worked out for you!!! I loved Miriam from the first sniff. It reminded me of several perfumes I wore years ago when I was 20 years old. My first love being the original L’Interdit. Not that Miriam smells exactly like it but I get the same feeling as I did years ago with L’Interdit. For a few moments, I am 20 years old again. Andy does it again! What a wonderful feeling! That’s quite a bonus to get from a bottle of scent. Lovely review and such interesting comments! I have to say the 7 ml bottle is calling my name. I do love sandalwood. And if the violet is there for me I will be extra-happy.